Allied Drain Cleaning uses several kinds of snakes to keep our customers drains flowing, we have everything from light duty to heavy duty. Contrary to popular belief, you need a different snake for different jobs. For example, you use a toilet snake for toilets and nothing else. A real drain pro is going to have a cornucopia of snakes and tools some of which may be unrecognisable even to other pros. The plumber who taught me the plumbing business has told me some of the weirdest stuff he has seen in the business was in my plumbing truck. This was his way of giving his star drain cleaner a compliment. Every time I run into him or get a chance to work with him, I catch him checking out my gear. We carry equipment for the usual sinks, tubs, and toilets. 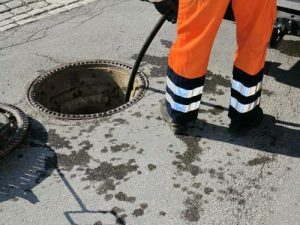 We also carry equipment for working on dry wells, dental equipment, x-ray machine drains, condensation lines, the tiny lines in bar sinks, roof drains, parking lot drains, and mostly any other type of drain.